Home > Product Solutions > Is Your Steam Quality Worse Than You Think? You're probably familiar with the terms ‘dry steam’ and ‘wet steam.' But just how dry is the steam used in your processes? Wet steam, i.e. steam containing water droplets, is extremely common even in piping used for processes that run 24/7. When steam isn't kept dry, your system is more like to encounter problems due to scale and other foreign matter. This is because the water droplets entrained in the steam can break off hard pieces of foreign matter such as dirt from the pipe walls, which then flow downstream. High concentrations of solidified conditioning agents used in boiler feed water can also cause problems. These can severely affect equipment service life and diminish productivity because of product quality problems. Installing a pressure reducing valve with a built-in separator/trap (e.g. 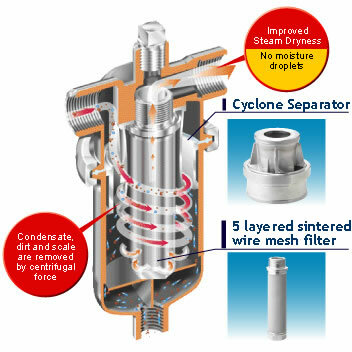 COSPECT®) or a cyclone separator/filter (e.g. DC or SF1 series) is a simple yet effective way of improving your steam quality. Fig. 1 These can severely affect equipment service life and diminish productivity because of product quality problems. Virtually all boilers produce steam with a certain amount of condensate in it unless additional superheating is performed. This is in part because steam dryness can decrease due to sudden fluctuations in load, causing some of the boiler water to get entrained within the flow of steam. Steam is constantly condensing into condensate because of radiation heat loss from piping. If condensate is not removed (through the use of steam traps), some of it will be picked up and entrained within the steam flow. Even with properly spaced and trapped drip legs, a certain amount of moisture entrainment is inevitable. Condensate entrained in steam is particularly devastating for heating processes where steam comes into direct contact with the product, such as those in food, rubber and textile applications. The condensate in the steam adheres to the surface of the product and can result in severe product defects. Even in indirect heating processes such as those using a heat exchanger, wet steam can lower the efficiency of heat transfer, reducing productivity. Water droplets and scale can also accelerate wear of strainers, isolation valves, elbows, and other piping elements. Non-discharged condensate can lead to failure due to trim erosion in pressure reducing valves, control valves, and flowmeters, as well as shorter service life of heat exchanger tube bundles. Wet steam can be detrimental in terms of flare stack pilot and flame control, and when delivered to turbines, can lead to critical failures resulting in expensive maintenance and unscheduled downtime for large sections of a steam using facility. Eliminate condensate, dirt and scale from your piping using the SF1's patented cyclone separator. Water and solid particles are removed before filtering to limit clogging and extend the filter maintenance cycle. You can benefit from nearly three times more time between maintenance cycles compared to conventional filters without a separator. The cyclone separator also supplies dry steam, eliminating water spots. Greatly improve your steam quality by installing a cyclone separator from the DC series, which forcibly separates water droplets entrained in steam or air pipelines and eliminates non-discharged condensate. DC series cyclone separators provide up to 98% separation efficiency!